Every time I update my fantasy football rankings there’s always one player who eats up far too much of time. I’ll be toiling away at my rankings, see their name, and then spend a solid hour in a cold sweat debating back and forth on where to rank them. In the most recent update, that player was Kansas City Chiefs RB Damien Williams. I have Williams ranked as my No. 17 overall player (RB12), while my fellow rankers both have him outside of their top-30. While I feel good about that ranking, I do know it’s not a true representation of his actual draft value, which is ultimately a far more nuanced interplay between risk and upside. He’s the lead back in a committee alongside Carlos Hyde (and/or a rookie to be named later). He’ll cede some portion of the team’s goal-line work to someone else (possibly a majority), while handling about 55% of the team’s carries and 70% of the team’s targets out of the backfield. On one of the best offenses in football, that’s probably still good for at least mid-range RB2 numbers. He’s Kansas City’s bell-cow running back and could legitimately be a fantasy league-winner (top-five fantasy running back) in 2019. The former scenario makes some sense. Williams has never eclipsed 13 carries in a single game across 74 career regular-season games. Hyde is set to make $1 million more than Williams in 2019, and the Chiefs have four top-100 selections available to take a running back in the draft. However, even if the Chiefs opt to employ a committee backfield in 2019, Williams is likeliest to earn the most valuable role. At the combine, Chiefs GM Brett Veach said “[the starting job] is Williams’ job to lose.” Of course, this was before the team signed Hyde, but I’m still not so sure he’s a serious threat. Over the past two seasons, Hyde ranks 65th of 78 qualifying running backs in yards per carry (3.66), 68th of 75 running backs in PFF run grade (63.1), and 56th of 56 running backs in PFF receiving grade (37.0). Furthermore, Andy Reid has rarely ever employed a committee backfield throughout his career. Instead, he’s used his lead running back as a bell cow, and to great fantasy success. 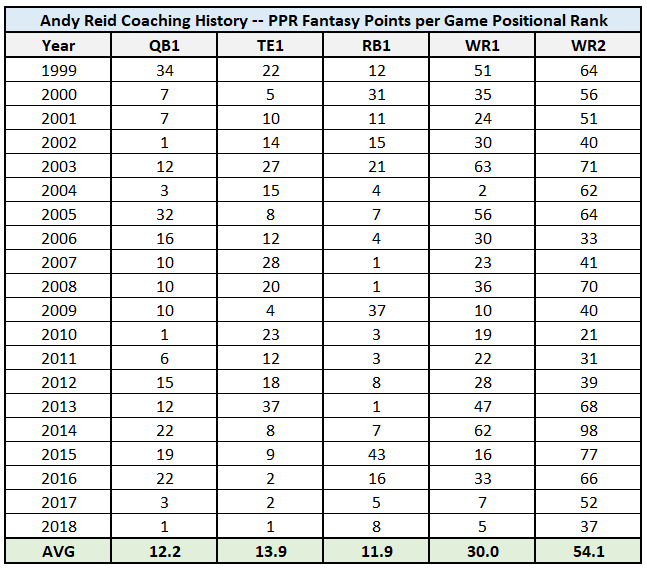 In 12 of the last 15 seasons, Reid’s RB1 has finished top-eight among running backs in fantasy points per game – a number unrivaled by any other active head coach or offensive play-caller. Of course, Reid has benefited from some highly talented running backs throughout his head coaching reign. Still, the numbers are staggering. His average over the past 15 seasons ranks among the league’s most elite fantasy running backs. You’ll also note Reid’s running backs have all been highly utilized in the passing game, which just so happens to be Williams’ area of strength. He averaged 5.5 targets per game over his last six games, while only five running backs averaged more than 5.5 targets per game last season (all were fantasy RB1s). Targets are also far more valuable than carries in fantasy leagues (2.74 times as much as a carry in PPR leagues). Williams was also used as a bell cow in the playoffs last season (granted, Spencer Ware was dealing with an injury), and was highly effective. Williams drew 77% of the team’s snaps, 92% of the team’s carries, and 93% of the team’s targets out of the backfield in the postseason. Ultimately, he averaged 4.5 yards per carry, while leading the team in yards from scrimmage (250) and touchdowns (four). 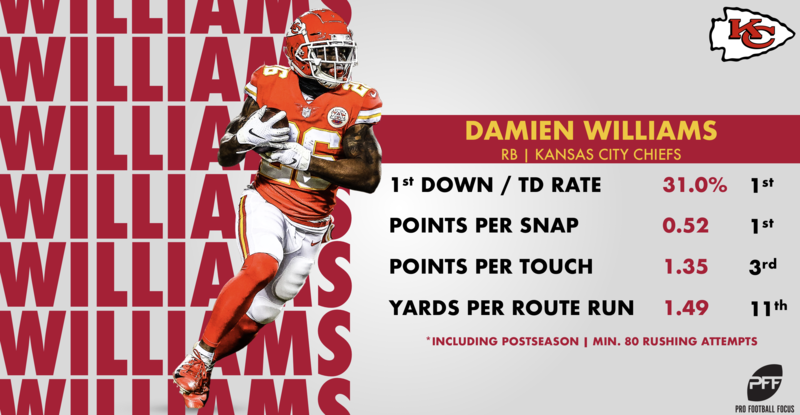 Williams wasn’t only effective in the postseason, but following the release of Kareem Hunt, the Chiefs saw little dropoff in performance transitioning from Hunt to Williams. Williams averaged a whopping 5.25 yards per carry and 25.8 fantasy points per game over his last five games of the season. Sure, that’s a small sample, but only eight running backs averaged as many fantasy points across any five-game stretch last season: Saquon Barkley, Christian McCaffrey, Todd Gurley, Alvin Kamara, Ezekiel Elliott, James Conner, Melvin Gordon, and Hunt. Given the production we’ve seen from Williams (in a small sample), from Hunt over the past two seasons, and from nearly all other running backs throughout Reid’s career, it’s clear Williams has sky-high upside. However, even if Williams isn’t a bell-cow running back in 2019, he won’t be as risky as most other committee backs, drawing good target volume on the league’s most efficient passing offense. Sure, Kansas City’s offense is due for a massive regression, but it’s also a far fall from what was the third-most productive offense in the history of football.